Will Wells Fargo Scandal Lead to Changes in Pay Plans? Oct. 5 — Wells Fargo & Co.'s clawback of $60 million in compensation from two top executives is not likely to prompt broad changes in corporate compensation policies, at least for now. Many companies have already aligned pay with performance. Companies also are waiting to see how a tougher regulatory regime for clawbacks under the Securities and Exchange Commission and other regulators evolves. The single biggest impact from the scandal could be that companies with narrowly tailored clawback policies may consider adopting provisions that will allow their boards more discretion to react to high-profile situations, Peter Kimball, associate director at ISS Corporate Solutions, told Bloomberg BNA. Wells Fargo Chief Executive Officer John Stumpf came under fire from lawmakers after the Consumer Financial Protection Bureau and other regulators fined the bank $185 million in September over employees' opening of unauthorized accounts. The bank—which didn't admit or deny wrongdoing in the settlement—had already fired 5,300 workers in the last five years over the misconduct. Stumpf Sept. 27 announced that he would forfeit $41 million in unvested stock compensation and his bonus for 2016. Carrie Tolstedt, who oversaw the bank's retail division, is forfeiting about $19 million (189 CARE, 9/29/16). The bank also said that independent directors at Wells Fargo are leading the company's internal investigation of the matter, together with the human resources committee and the law firm Shearman & Sterling LLP. 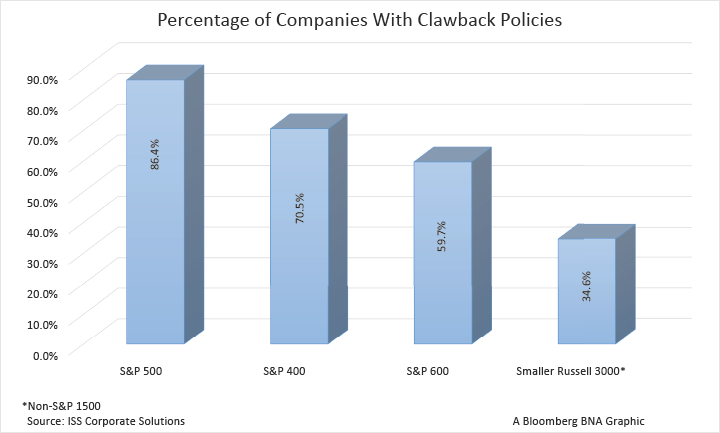 Clawback policies have become the norm in the U.S., especially at larger companies. According to ISS Corporate Solutions, 86.4 percent of S&P 500 companies and 70.5 percent of S&P Midcap 400 companies have clawback provisions. Conversely, only 34.6 percent of the smaller Russell 3000 companies have such requirements. Most U.S. companies reserve their broadest recovery options for times when the company restates all or a significant part of its financial statements. But while the policies are common, recouping compensation already paid is “extraordinarily rare,” Kimball said. he most significant clawback of all time is the SEC's 2007 settlement with UnitedHealth Group Inc. CEO William McGuire, in which the agency recovered about $600 million under the 2002 Sarbanes-Oxley Act. Sarbanes-Oxley Act Section 304 requires CEOs and chief financial officers to reimburse pay under certain circumstances when misconduct leads to a financial restatement. Meanwhile, the Dodd-Frank Act requires federal agencies to expand clawbacks. In July 2015, to implement the financial reform statute, the SEC proposed a rule that would increase the types of covered executives, and recoup compensation whenever there is a restatement impacting the amount earned, even if there is no fraud or misconduct (13 CARE 1509, 7/3/15). In April, the SEC and five other financial regulators, including the National Credit Union Administration and the Federal Reserve, issued proposed rules that would let financial institutions recoup bonuses—even those already vested—if an employee takes inappropriate risks, draws an enforcement action or exceeds a firm's risk limits and causes a loss (78 CARE, 4/22/16). Many companies likely will wait until these rules are finalized before making any major changes to their pay programs, Kimball said. The prevalence of corporate clawback policies ultimately will increase, Kimball predicted. “But the timing of that depends as much on the” SEC and other rulemaking as it does on the eventual outcome of the Wells Fargo situation, he said. In the meantime, one compensation consultant—Mercer LLC—is recommending that companies carry out detailed assessments of their sales incentive plans at all levels to ensure performance measures, plan design, structure and timing of payouts don't create conflicts of interest for employees. Companies also should ensure that their pay programs encourage employees “to do what's right for the customer,” Vicki Elliott, leader of Mercer’s Global Financial Services Talent Network, told Bloomberg BNA in an e-mail. “A precedent for boards to claw back substantial compensation from top executives has now been established, so it may very well set the bar for situations which may occur in other large financial institutions,” Elliott said. George Georgiev, a business law professor at Emory University, suggested that the focus should be board oversight, rather than instituting more rigorous clawbacks and pay programs. The decade-long attempts at regulation and the persistence of corporate scandals show that reforming executive compensation is “devilishly difficult,” Georgiev told Bloomberg BNA in an e-mail. He observed that the Wells Fargo board only acted to enforce its clawback policy after public reaction to the issue became too loud to ignore. “I would favor more oversight by boards over additional complexity in compensation practices,” Georgiev said. Additional complexity only makes it easier, and creates multiple opportunities, for executives to game the system, while making it harder for boards and investors to oversee companies, he said.